Among the many surprises and satisfactions that the Havana night generally offers both visitors and nationals, the Tradicionales de los 50 (1950s Traditionals) show occupies a privileged place. The show takes off every evening at Sociedad Rosalía de Castro at 9:30pm and lasts two hours. Centrally located on Egido 504 entre Monte and Dragones, just a couple of blocks from the Capitolio Nacional and the Saratoga Hotel in the fringes of Old Havana, the Rosalía de Castro Society has become since late 2012 the home of this project, which is a valuable part of the Cuban musical heritage. I am convinced that if you want to have a clearer and more accurate picture of how Cubans feel things and how we express our passions and joys, this show, besides entertaining, speaks very clearly of our nature and our sense of hospitality. The project is linked to a golden age of our music, which then grew and became more universal. In the fifteen years that have passed since the project was launched, it has woven a beautiful story, whose protagonists speak about with both pride and emotion. What is considered today by many as the best product of Cuban popular music offered in Havana, took off in 2001 under the guidance and enthusiasm of José Roberto Rodríguez Alpízar, who brought together the artists that give meaning to this beautiful and enduring idea. Although the show had performed previously at the Hotel Nacional and the Salón Rojo of the Capri Hotel, its entry into the Old Havana circuit takes place at the Amigos del Beny café-tavern, located on the corner of Mercaderes and Teniente Rey streets in 2001. In their first performances, the singers were accompanied by Barbarito Torres (Buena Vista Social Club tres player) and his group. We need to point out that Tradicionales de los 50 have always had guest musicians from Buena Vista Social Club and Afro-Cuban All Stars. Around 2008, the group began to offer performances at the Rum Museum located on the Avenida del Puerto. Here, they remained for several years, helping to boost the growth of tourism in this institution and its surroundings. They also offered their music at the Santo Angel Restaurant, situated on one corner of Plaza Vieja, before coming to their current venue. Bands that have accompanied the Tradicionales de los 50 after Barbarito Torres, include Charanga Rubalcaba, Septeto Matamoros, Grupo de Pío Leyva, Caña Santa, Conjunto de Roberto Faz and currently Gloria Matancera. The latter, founded in 1927, is one of the oldest popular music bands in Cuba, a true relic of our musical history. Important singers and musicians have performed with the Tradicionales, like Omara Portuondo, the Buena Vista Social Club Diva; Guajiro Mirabal; the Buena Vista “Fab Four”; Yanko Díaz; Osdalgia, Rolo Martínez; Emilio Morales; Julio Alberto Fernández; Sierra Maestra; El Muso and Ela Calvo, just to name a few. I would like to especially mention an exceptional figure of Cuban entertainment: Juana Bacallao, and Tradicionales de los 50 feel that it’s a privilege to be able to enjoy her presence every evening in every show. Juana exudes joy, fun and lots of spark that she passes on freely. The Tradicionales show is a true reflection of Cuba. 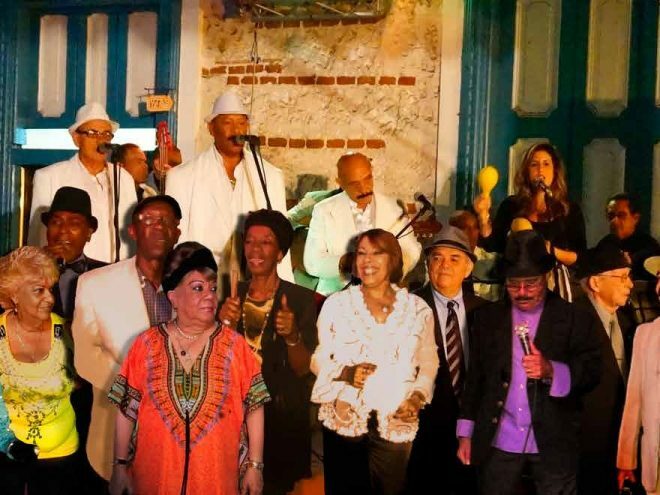 Visitors to the Rosalía de Castro Society will have the chance to enjoy legendary songs like “Dos Gardenias,” sung by Mundito González; “El Carnaval” and “Kimbara,” both sung by Raquel Hernandez; “Silencio,” a song that becomes larger than life in the powerful voices of Pablo Santamaría and Migdalia Echevarría; “Dame un traguito” by Juan Almeida, sung by Muso; “El Cuarto de Tula,” by Arango; and “Lola,” sung by one of the bolero greats in Cuba, Orestes Macías, becomes a milestone. The singing is complemented by Tradicionales del son, a couple who dance to genuine, 1950s Cuban rhythms. The show ranges from Compay Segundo’s famous “Chan-Chan” to Joseíto Fernández’s “Guantanamera,” and takes a side tour round “Melao de caña,” “El Feo” and “La Mujer de Antonio.” A guaguancó, which combines percussion, singing and dancing, is an essential part of the program and one that visitors will always remember. Each and every one of the performances is an exhibition of the Golden Age of Cuban music. To be able to take in all this energy and memories, as well as having spent two hours filled with genuine Cuban music made by popular performers means that visitors will be taking back home a unique gift from this island.